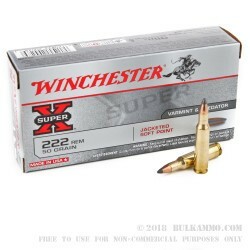 Varmints don’t stand a chance against the superior Winchester Super-X brand of 222 Rem 50 grain jacketed soft point rounds. With a staggering 3,140 fps muzzle velocity, you’ll be able to put good distance between yourself and skittish game like woodchuck and coyote. The soft point on the bullet promotes extremely rapid expansion upon impact, further bolstered by the following lead core. 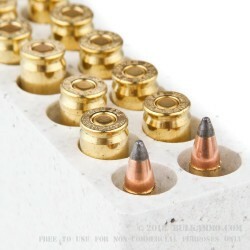 The bullet’s wall jacket is thin, which reduces engraving forces and improves accuracy as the result. 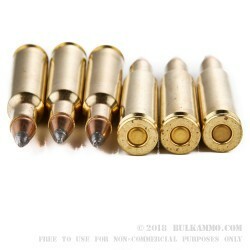 This round further offers a clean burning propellant that will minimize the accumulation of powder residue in your rifle, and its Boxer primed brass casing is non-corrosive and reloadable for cost-conscious shooting enthusiasts. Winchester was founded in 1873, fewer than ten years after the Civil War, and earned country-wide repute when they introduced the first successful centerfire cartridges. 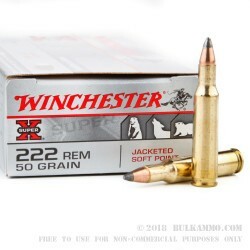 More than a century later they maintain their reputation for innovation and quality, as thoroughly evidenced by this hard-performing 222 Rem round.